Sarah Grimke is the middle daughter. The one her mother calls difficult and her father calls remarkable. On Sarah's eleventh birthday, Hetty 'Handful' Grimke is taken from the slave quarters she shares with her mother, wrapped in lavender ribbons and presented to Sarah as a gift. Sarah knows what she does next will unleash a world of trouble. She also knows that she cannot accept. And so, indeed, the trouble begins. 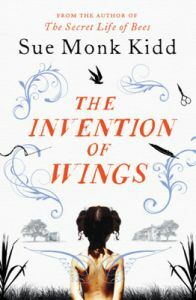 A powerful, sweeping novel, inspired by real events and set in the American Deep South in the nineteenth century, The Invention of Wings evokes a world of shocking contrasts, of beauty and ugliness, of righteous people living daily with cruelty they fail to recognize and celebrates the power of friendship and sisterhood against all the odds.